If you have those shiny stainless steel appliances in your house and always wanted a blow dryer to match, today’s your lucky day! Seriously, though. 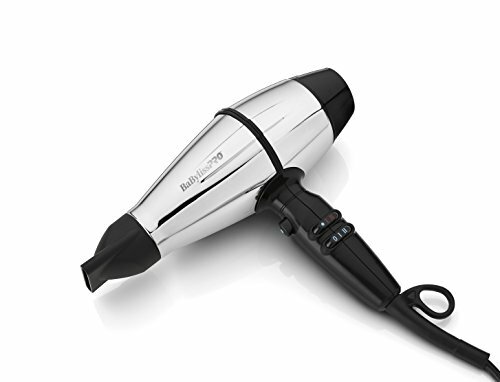 Check out the look of this Babyliss Pro Steel FX hair dryer and say it doesn’t look cool. Its sleek, futuristic design alone sets it apart from the others. This blow dryer is not just there to dry your hair; it’s aesthetically pleasing as well! We already know BaByliss has a pretty good rep in the blow dryer world. With its $159.99 price point and as part of the Pro line, the Steel FX should definitely be a professional quality. But is this dryer worth its weight in steel? Let’s take a look at some of its features and see whether we can determine the answer to that. It can get pretty loud at times with all the stuff going on simultaneously. BaByliss has taken this into account and created a solution. Thank you, BaByliss! Now there’s no need to leave the salon with your ears ringing or your throat raw. Yeah, it’s got Ferrari power! This means, according to the Babyliss website, that it’s “Lightweight, long-lasting, outstanding performance.” It’s probably a safe bet that 2000 watts of Ferrari-backed power will do a pretty good job drying your hair or the hair of your clients! And lightweight is never a bad thing when it comes to hair dryers. This one’s under 3 pounds. For those who are annoyed by the buttons typically being right in the spot where your fingers go, you’ll like this one. The Pro Steel FX’s buttons that provide 3 heat and 2 speed settings are on the side of the blow dryer’s handle, making your life that much easier. And if you don’t prefer that either, you can always hold the barrel, as advertised. As an added bonus, the cold shot button is also positioned easily for your trigger finger for the times you need it. BaByliss knows what’s up. Okay, so this isn’t a huge deal. Or is it? If you’ve ever had those stainless steel appliances mentioned above, you know their one downfall—fingerprints. Again, BaByliss knows what’s up. They include a microfiber cleaning cloth so your professional modern-looking dryer can stay that way. Besides the cleaning cloth, it’s worth mentioning that you get a storage pouch in addition to the usual concentrator nozzle with this BaByliss. Makes it feel that much fancier. Oh, and a 9-foot cord is always a good feature as well. Overall, it seems that the BaByliss Pro Steel FX 2000 is worth its weight in not only steel, but maybe even in bronze, silver, gold, platinum, titanium…all the metals. It’s sturdy, sleek, and powerful, drying your hair quickly, and its Ferrari-designed motor will last through many drying sessions. This is one hair dryer that works well and you’ll have fun using it. Way to go, BaByliss!